Awareness is the key word to successfully deal with Tor. And if this is what Ruggerio Isernia says, you will have to believe it: he has been a finisher in every editions of the trail. He earned the chance to be in the 2014 edition of Tor des Geants right on the field, or, better said, on the path, which, with its 330 km lenghts, keep the Valle d’Aosta territory together as a unique line. It could have been anyone but him to start a collection of “Tor des Géants tales”: Ruggero Isernia, “senator” for taking part (and brilliantly finishing) each of the four edition of Tor des Géants. His Tor has always been done with mental lightness, having fun and, first of all, with self awareness. He has no interest in placement and just one unique aim: enjoying it. This is the right way to deal with an endurance trail. Isernia was born in Vercelli, he lives in Milan and he has been involved with Courmayeur since “ages”, since when his parents bought there the classical second house for holidays. “ A part from being confident with tools that can protect you such as technical equipments, compass or weather forecast instruments, security is a mental status. You have to deal with any trail, and most of all with Tor, with the certainty that you have done everything you could to get ready in the best way possible; you have to have reasonable expectations and not to fear your own pride in case you have to withdraw for a real danger. In four words: always do, never overdo. Of course being used to mountains since childhood, as I am, can be very useful and make it easier. Easy and incisive thinking fot this athlete who started doing trails just in 2008. 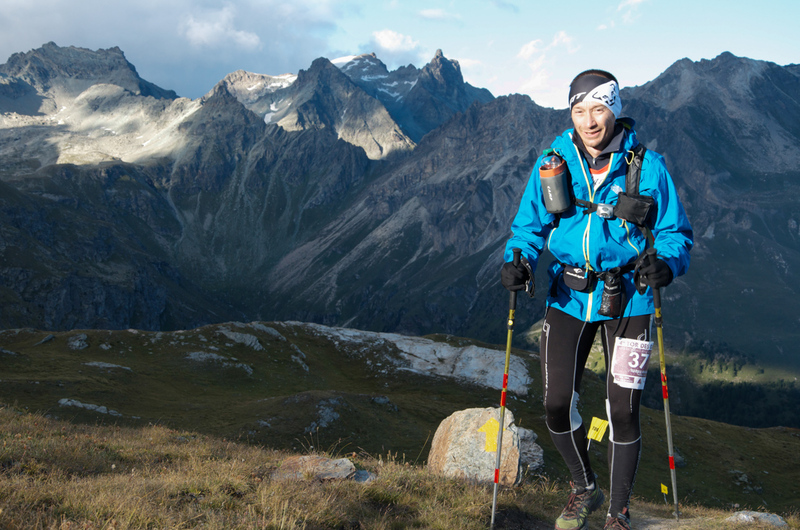 “ I did one of the UTMB competition and, in Chamonix, I found a paper advertising the first edition of Tor Des Géants. I took it and, as we all normally do, just put it in my pocket. Some days later, reading it again, I found out that it was a gran tour of “ my” valley, who was gonna go through lot of streets and paths I already know. So, it came natural to me to subscribe. The first edition is the one I feel I have had better: probably it was because noone had a way to confront his results with other trail with the same lenght or height and so everyone was running more carefully. How do I train for 2014 edition? I run one hour in the morning in a park in Milan, I walk in the Val d'Aosta mountains in the weekend and I take part in some competitions in which I constantly increase the running distance. I want to get to Tor in the best shape possibile and have fun. As usual."